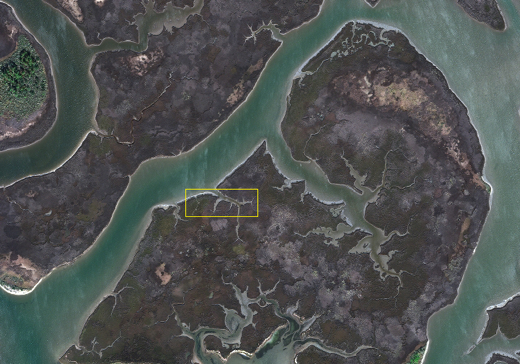 True color satellite image of Grand Bay National Estuarine Reserve shows a segment of the 200 meter wide test range transect. Area within the transect has been classified according to landcover/vegetation type. Sampling location points are indicated in orange. The University of Southern Mississippi, Gulf Coast Geospatial Center created the NOARC Applications Research Test Range at the Grand Bay NERR. Its purpose is to test and validate new remote sensing technologies deployed with unmanned airborne systems over a known coastal zone landscape with precision elevation control. The NERR serves a vital role in NOARC applications development by providing a natural system reference site that is typical of coastal wetlands, coastal watersheds, and maritime forests. The NERR staff maintains a network of Surface Elevation Tables to determine changes in marsh elevation. USM staff expanded the NERR network with 64 additional randomly selected points sampled for landcover and elevation. Surface elevation of these points were measured at ± 2.0cm. The 200 meter by 6500-meter test range transect covers 130 hectares and encompasses all wetland habitats and vegetation communities within the NERR. Wetland elevation measurements are key to determining whether a wetland is sustaining itself or is degrading. Improved elevation measurements and landcover delineation with unmanned airborne systems and LIDAR instruments are key applications research themes that NOARC is developing with its research universities and private partners. The NERR test range is the initial proving ground for validating LIDAR instrument performance over an area with absolute ground control points. 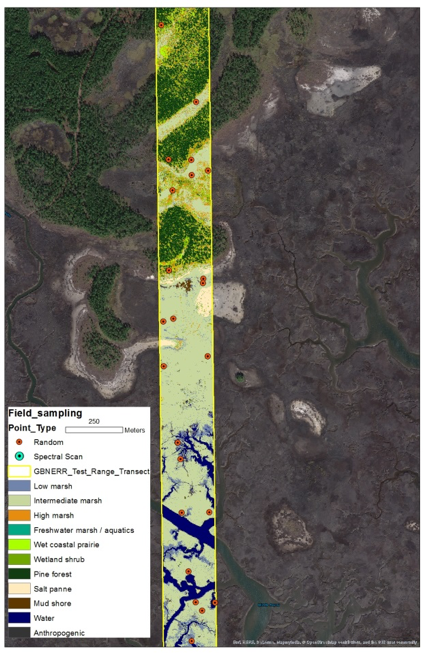 Currently satellite imagery and extensive ground truth is used at the NERR to establish baseline habitat maps and monitor wetland vegetation communities as depicted in this image. DigitalGlobe Worldview 2 was used by NERR USM GCGC staff to create the corresponding landcover map with the illustrated landcover categories. Advances in satellite imagery with the advent of Worldview 3 with 2.0-meter multispectral data and a 0.31-meter pan sharpening band were examined by the NOARC team as an update mechanism for current NERR landcover benchmarks. Satellite imagery has proven to be an effective geospatial tool for regional and NERR-wide habitat analysis and will be used as the backdrop for subsequent work in the Hancock County Marsh Preserve. We plan to augment satellite imagery with precision airborne imagery collected with UAS to conduct site specific mapping and long-term change detection analysis. At 2cm, we can not only map but also measure the shoreline in very high detail. Satellite image depicts an area of the southern NERR at 2 meter resolution. Yellow rectangle indicates the extent of the area shown below in C-Hawk image. Image of the southern NERR collected by C-Hawk at 2 centimeter resolution. Site designed and built by Moxii Media.